It is more than the tide that ebbs and flows in the Ocean Drive section of North Myrtle Beach, South Carolina. Here is where you can find beach clubs where the beach music flows and has a welcome rhythm all its own. And here is where you can also find Chateau by the Sea, a North Myrtle Beach resort that is across the street from the beckoning beaches. Brighten your North Myrtle Beach vacation with reservations for this second-row North Myrtle Beach resort and enjoy close proximity to the Atlantic Ocean, nearby attractions, live entertainment theatres and Myrtle Beach golf courses. Most of all, enjoy an oceanfront sun deck with a sparkling blue swimming pool, spacious accommodations for six people and all the modern conveniences that will make this North Myrtle Beach vacation one to remember! Chateau by the Sea has three levels of North Myrtle Beach condominiums and they all have an ocean view. 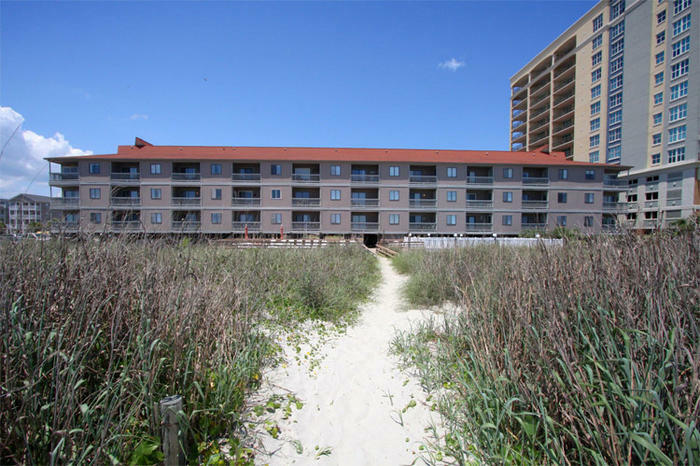 All of these condos in North Myrtle Beach, South Carolina have two bedrooms. With a sleeper sofa in the living room, all of these North Myrtle Beach vacation rentals accommodate up to six people comfortably. Staying in these North Myrtle Beach condominiums is a far cry from squeezing into a small hotel room for your North Myrtle Beach vacation. The condo rentals at Chateau by the Sea have two private bedrooms, two baths, a full kitchen and a comfortable living room. It is like being at home, only when you are at Chateau by the Sea, you are indeed by the sea. The kitchen in each of these North Myrtle Beach condominium rentals is large. They feature full-size appliances, including a dishwasher, so you can cook, cool and clean with ease. There is plenty of countertop space in these kitchens and some of the North Myrtle Beach vacation rentals are even furnished with bar stools so that you can sit at the breakfast bar. Your family might find a ceiling fan in the living room at your Chateau by the Sea rental. You will definitely find sliding glass doors that open to the private balcony. It is through these doors that your family goes out to the balcony and through these doors the sunshine streams inside. You can see through these doors from the living room, dining area and kitchen and you can also feel the sea breezes from throughout these North Myrtle Beach condos when the door is ajar. The master bedroom of the North Myrtle Beach vacation rentals at Chateau by the Sea has balcony access as well. You just might become spoiled by having the morning sun peek inside your master suite during your North Myrtle Beach vacation and you will definitely become accustomed to hearing the waves crash ashore right outside as you lie down for a good night’s rest. What a lullaby! Additional amenities in each of these non-smoking North Myrtle Beach vacation rentals include a DVD player and multiple televisions and a washing machine and clothes dryer! You have everything you possibly need at your fingertips in these North Myrtle Beach condominiums. Your beach vacation will be divine when you have a private kitchen, private laundry facilities and easy beach access within reach. Chill out in the swimming pool or stretch out on a lounge chair right next to the pool deck. There are tables and chairs on the wooden sun deck so you can have an oceanfront picnic with your family during your North Myrtle Beach vacation. Play games on the white sandy beaches and go for long walks to soak in the North Myrtle Beach ambiance. Near the pool deck of Chateau by the Sea is a grill area you are welcome to use. Cook up some hamburgers and hot dogs or go the seafood route and grill whatever you caught that day or whatever was fresh as the local seafood market. Walk to Main Street from Chateau by the Sea and discover shopping, dining and entertainment! The Ocean Drive section of town is quite popular and Chateau by the Sea is within walking distance of all the sights that it so popular. Delicious lunch specials and charming boutique shops are found on Main Street and you can often hear the sound of beach music streaming through the air. Live beach music is a mainstay at many places on Main Street and it is not difficult to find shag dance lessons at the beach clubs that call the Ocean Drive section of North Myrtle Beach, South Carolina home. Just minutes beyond Main Street and the Ocean Drive section are live entertainment theatres, restaurants, outlet malls, championship golf courses and amusements. Water sports in the area include banana boat rides, parasailing and Sea Doo rentals. So much to do in one North Myrtle Beach vacation at Chateau by the Sea.